Synthetic peptide corresponding to Mouse SNAP25 aa 195-206. ICC/IF: PC12 cell line. WB: Whole rat brain extract. Our Abpromise guarantee covers the use of ab5666 in the following tested applications. Immunofluorescence staining of SNAP-25 in cultured rat hippocampal cells with ab5666 yields a pattern consistent with cytoplasmic and plasma membrane staining. WB Use a concentration of 0.5 - 2 µg/ml. Detects a band of approximately 25 kDa.Can be blocked with SNAP25 peptide (ab5843). Flow Cyt Use 3-5µg for 106 cells. t-SNARE involved in the molecular regulation of neurotransmitter release. 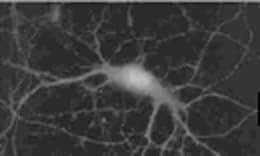 May play an important role in the synaptic function of specific neuronal systems. Associates with proteins involved in vesicle docking and membrane fusion. Regulates plasma membrane recycling through its interaction with CENPF. Belongs to the SNAP-25 family. Contains 2 t-SNARE coiled-coil homology domains. Palmitoylated. Cys-85 appears to be the main site, and palmitoylation is required for membrane association. Cytoplasm > perinuclear region. Cell membrane. Cell junction > synapse > synaptosome. Membrane association requires palmitoylation. Expressed throughout cytoplasm, concentrating at the perinuclear region. ICC/IF image of ab5666 stained PC12 cells. The cells were 4% paraformaldehyde fixed (10 min) and then incubated in 1%BSA / 10% normal goat serum / 0.3M glycine in 0.1% PBS-Tween for 1h to permeabilise the cells and block non-specific protein-protein interactions. The cells were then incubated with the antibody (ab5666, 5µg/ml) overnight at +4°C. The secondary antibody (green) was ab96899, DyLight® 488 goat anti-rabbit IgG (H+L) used at a 1/250 dilution for 1h. Alexa Fluor® 594 WGA was used to label plasma membranes (red) at a 1/200 dilution for 1h. DAPI was used to stain the cell nuclei (blue) at a concentration of 1.43µM. Flow cytometry analysis of Neuro-2a cells using ab5666.Cells were fixed with 70% ethanol for 10 minutes,permeabilized with 0.25% Triton™ X-100 for 20 minutes, and blocked with 5% BSA for 30 minutes at room temperature.Cells were labeled with SNAP25 (red histogram) or with rabbit isotype control (pink histogram) at 3-5 ug/million cells in 2.5% BSA.After incubation at room temperature for 2 hours,the cells were labeled with Alexa Fluor® 488 Goat Anti-Rabbit Secondary Antibody at a dilution of 1:400 for 30 minutes at room temperature.The purple histogram represents unstained control cells and the green histogram represents no-primary-antibody control. SNAP25 was immunoprecipitated using 0.5mg Mouse Brain tissue lysate, 5µg of Rabbit polyclonal to SNAP25 and 50µl of protein G magnetic beads (+). No antibody was added to the control (-). The antibody was incubated under agitation with Protein G beads for 10min, Mouse Brain tissue lysate lysate diluted in RIPA buffer was added to each sample and incubated for a further 10min under agitation. Proteins were eluted by addition of 40µl SDS loading buffer and incubated for 10min at 70oC; 10µl of each sample was separated on a SDS PAGE gel, transferred to a nitrocellulose membrane, blocked with 5% BSA and probed with ab5666. Secondary: Clean-Blot IP Detection Reagent (HRP) at 1/500 dilution. Immunlocalization of SNAP-25 in cultured rat hippocampal cells using ab5666. Anti-SNAP25 antibody (ab5666) at 1/10000 dilution + Whole tissue lysate prepared from mouse hippocampus. Publishing research using ab5666? Please let us know so that we can cite the reference in this datasheet. I can confirm that ab5666 SNAP25 antibodyis provided at 1 mg/ml. I have updated the online datasheet.